In never-before-broadcasted depositions, attorneys for the Securities and Exchange Commission ask Holmes questions about whether she helped orchestrate an "elaborate, years-long fraud." Elizabeth Holmes, once silicon valley's fastest rising star is now under the glare of a very different spotlight. She's finally forced to answer to the securities and exchange commission as she's investigated for an alleged, elaborate years-long fraud. Do you swear to tell the truth, the whole truth and nothing but the truth? I do. Reporter: Suddenly, the woman who always seemed to have all the answers. We are the only lab company that is actually really focussed on leading with transparency. Reporter: Now had none. I don't know specifically. I'm not sure. I don't know exactly. I just don't know. Reporter: With theranos' claims now under the microscope. Did it concern you that a number of tests weren't working on theranos' devices? Reporter: Her carefully-crafted narrative began to unravel, like the careful claims she peddled to board members like George Schultz, the former secretary of state. No. Was a theranos device ever deployed in the battlefield? No. Was it ever deployed in a medevac helicopter? No. Reporter: She was challenged. Sentence by sentence in what she told "Fortune" in that star-making cover story. They offer 200 and are ramping up to offer more than 1,000 of those tests all without the need for a syringe, was that statement correct? Reading it now, I don't think it is. Reporter: There was another significant detail she had been less than forthcoming about. Were you and sonny ever engaged in a romantic relationship? Yes. When? For a long period of time. Would you say for the majority of that time, were you living with Ms. Holmes? Yes. Did you ever tell investors that you had a romantic relationship? No. Personally me talking to investors one on one telling about my relationship, no. It was concealed from the board, from the press. It was concealed from investors. Reporter: You think it was intensional that they hid it. Oh, it was absolutely intentional. Reporter: As revelations about theranos started to unfold and her grandiose vision versus reality came clear. Now to the stunning fall -- Reporter: The FCC had enough charges to bring against her. And so did the department of justice. Elizabeth Holmes and another former executive await a criminal trial. Elizabeth Holmes stepping down as the chief executive officer. Reporter: Holmes pleaded not guilty, by September 2018. The company was officially out of business. How big of a deal is this? I think it's probably the most interesting fraud case I've dealt with, bernieoff would be second. Reporter: And you think they'reimilar people. I think they're very simar people. Smart, charming, poised. Reporter: Elizabeth and her counsel did not respo tr peated req for comment. But we did get this interview. 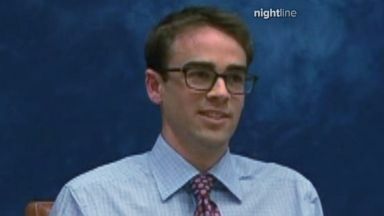 If you were to give him a grade on the job he did at theranos, what would you give him? I would give him an a plus for dedication and effort, but obviously, when we look at this after the fact and it's been a business failure, he's sorry about that, but that's not fraud. 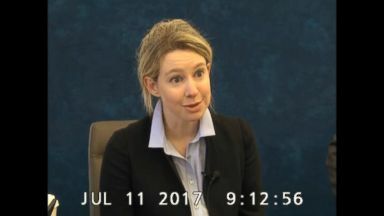 Reporter: It seems like a central component of your case was that theranos was on the right track and if they had enough time they would have got P it 100% right. I think eventually the company would have been a great success if it had been allowed to run. Reporter: When it comes to our health, people want to know it's 100% accurate day one. They want to know that what's inside of a Walgreens or at their doctors' office will actually do what it says it will do. You know, Rebecca, that's true, but the unfortunate thing sus doctors nn har?? lo perfect Reporter: A lot of people will say fake make it. Fake it till you make it doesn't work in health care, because you're talking about people's health. So many people wind up in jail for such little things. This is not a little thing. And it's also, not only did they fool the investors, they fooled the media. They fooled patients. They fooled doctors. Reporter: But as Elizabeth herself once declared at a Forbes conference, she is not a woman who will go down without a fight. When you have that passion, you will get back up when you get knocked down, and you will get knocked down over and over and ever and over again and you win by getting back up. And I would start this company over 10,000 times if I had to. Reporter: Stay with us. 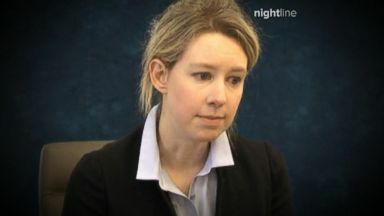 In podcast and "Nightline" doc, "The Dropout," ABC News' Rebecca Jarvis tells the story of Theranos founder Elizabeth Holmes, accused of defrauding investors. Holmes has pleaded not guilty. Holmes responds to questions regarding claims she made about her now defunct biotech start-up's blood-testing device, which had attracted high-ranking former military and political investors. 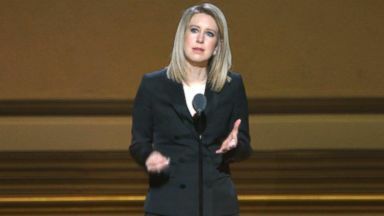 Tyler Shultz, the grandson of George Shultz, one of Theranos' former board members, says CEO Elizabeth Holmes knew the company's devices couldn't perform all the blood tests she claimed they could. Elizabeth Holmes has pleaded not guilty to allegations that she knew her company could not deliver accurate blood-test results.